Properties: Moderate strength with low stretch, good UV stability. Uses: A good general purpose braid for carrier bag handles, light pulls, draw cords, etc. Available in a range of 18 colours, including shades of: red, blue, green, orange, yellow, violet, brown, black and white. We will be pleased to supply yarn/braid samples on request. Cardboard flanged reels – 100 to 250m depending on braid diameter. Braids are generally produced in one of two constructions described as 1/1 (one-over-one) or 2/2. In our lists 1/1 is indicated by a prefix 8 (R), eg PP 8/48, and 2/2 by prefix 16 (S) eg PP 16/96. They differ in appearance with the 2/2 (S) plait producing a smoother, more regular surface appearance. The braid's 'tube' or 'hole' can be wholly or partially filled with yarns or other materials to produce core braids or even a smaller diameter braid (to produce 'braid-on-braid'). This may be useful to stop the braid from flattening or to confer some additional property, such as greater strength or extra stiffness. In other cases, the use of a cheap core material allows a larger diameter braid to be produced at lower cost. Tightness of the 'weave', expressed in terms of 'picks per inch' (or 2.5cm), will affect the flexibility or stiffness of the braid; in general the stiffer the braid the higher its resistance to abrasion. 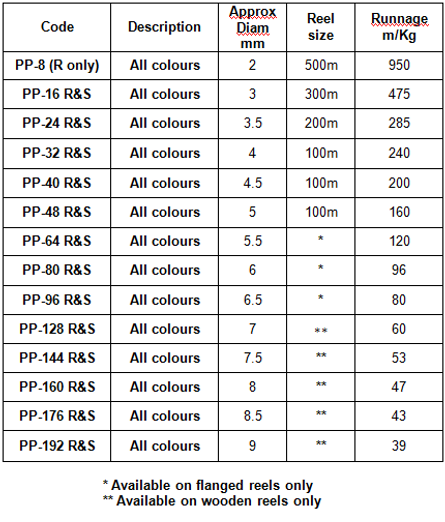 Minimum order quantities:- These will vary depending on the diameter and type of braid and are stated on the appropriate price lists. Smaller quantities can be supplied but will attract a premium.